Google's Pixel 3 and Pixel 3 XLwith OLED displays, 5.4” 1080 x 2160 (447 ppi) and 6.7” 1440 x 2960 (491 ppi), respectively will be unveiled in a couple of weeks. Their cameras are expected to sport a special feature. The company is bundling the Google Lens system inside the camera app, according to an XDA-Developers, which centers on a leaked video from Twitter user @IshanAgarwal24. He tweeted screenshots of Google Lens working inside the Pixel 3's camera; there will be no need to tap a button to get Google Lens to work; it will turn on automatically. Google has been offering its Lens service in other Android-based devices, but they don't offer real-time support like the Pixel 3 should. Google Lens is essentially an artificial intelligence platform that can understand what is in your camera's live view and give you information on it. For example, by pointing the phone at a business card, Google Lens will recognize it, access the info and store it in the contact file, which previously regarded a separate App. 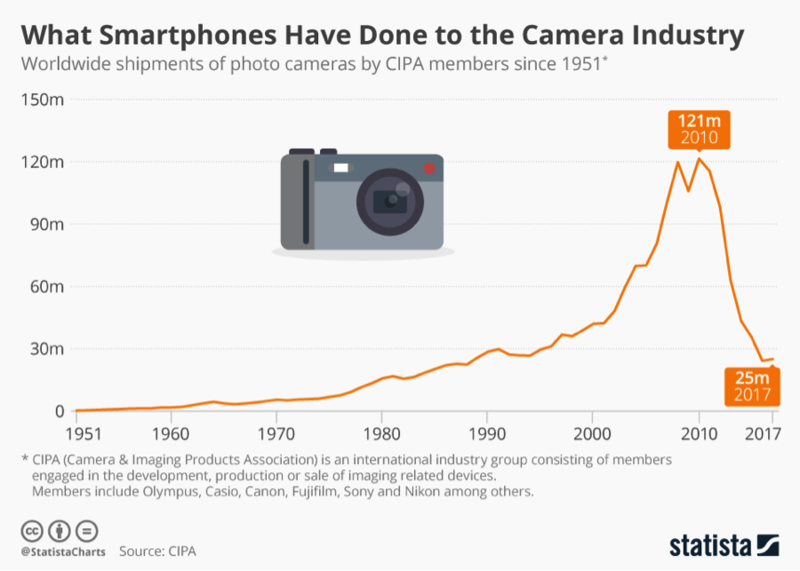 While we’re talking about the growth in # and performance of smartphone cameras, we look to Statista for a chart which shows their disintermediation unto the digital camera business. In 2010, at its peak, there were 121m digital cameras shipped, last year the figure was down to 25m.